Kyung-A Lee appeared on Show 237 in June 2011 at age 15. 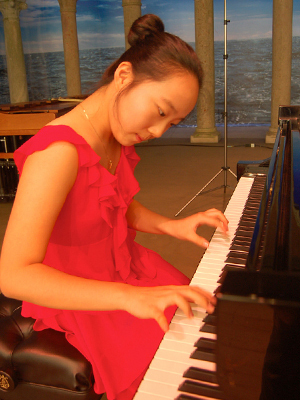 Kyung-A Lee (piano), age 15, hails from Westbury, New York and attends Mineola Middle School. She is a recipient of From the Top’s Jack Kent Cooke Young Artist Award. Kyung-A studies the piano with Veda Kaplinsky at Juilliard in New York City. She also plays the violin in the Mineola Middle School Orchestra and is a member of the Juilliard Pre-College Choir. Kyung-A has performed in many festivals including the Germany Rheingai Music Festival and the Seoul Spring Chamber Music Festival. In her free time she enjoys studying, exercising, and singing. Kyung-A is a Jack Kent Cooke Young Artist.